Pour your coffee. Light a candle. Gather your journal, pen and Bible. 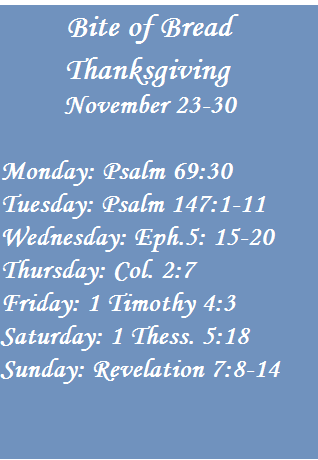 This week we’ll finish our reading plan focused on thanksgiving. Some of us are walking through difficult circumstances while others are experiencing a season of blessing overflow. I want to encourage those of us whose blessings are spilling over to share our abundance. But also practice sharing in the good times and bad. Because of Christ we’ve got everything. Hope to see you on our fellowship page as we discuss these scriptures through the week. Simply “like” the page to receive the feed on Facebook. What’s your favorite Thanksgiving memory? I think mine is watching the Charlie Brown Thanksgiving Special while my mom baked in the kitchen. (Smile.) I can still feel the warmth and smell the goodness.